Along the shore at Baddidarach there is some rich, rocky woodland containing oak, aspen and hazel. 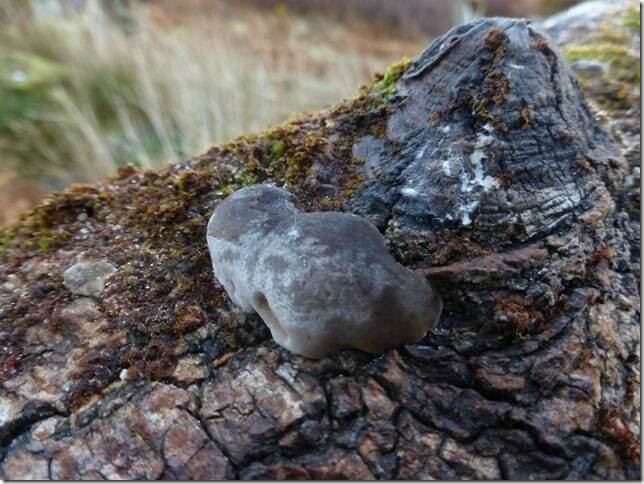 Gwen Richards and I were battling our way through it on 9th January, on our way to recording the birds of a Non Estuarine Waterbird Survey sector, when she spotted a group of unfamiliar fungi on the trunk of a large fallen aspen (NC08312252). They were quite hard, grey buttons, with a whitish bloom, about half an inch in diameter, and after she had photographed them, I collected one for further examination. They didn’t seem to match anything in the books available to us, so I later took a specimen down to Bruce Ing. He was able to identify them as immature fruiting bodies of the aspen bracket Phellinus tremulae. 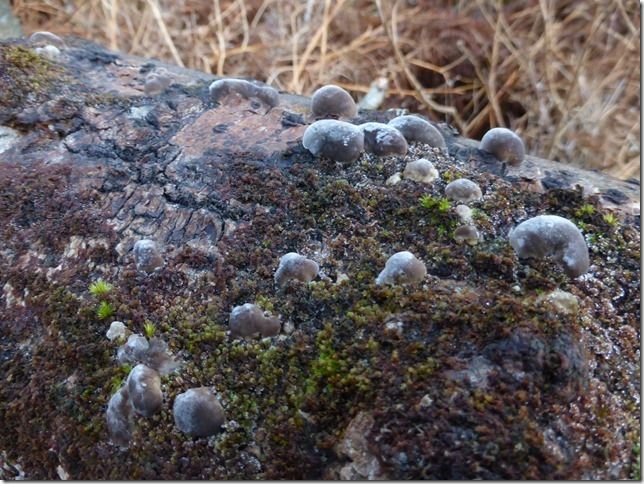 This is described in the Collins Fungi Guide (Buczacki et al., 2012) as ‘On wood of living trunks of aspen, parasitic, causing white rot.…Central Highlands of Scotland. Very seldom recorded.’ Bruce confirmed that its distribution is centred on the aspen woods of the Spey Valley, although he has found it in Easter Ross. It is probable that the tree concerned was already being attacked by the fungus when it fell. The change in the orientation of its trunk will challenge the fruiting bodies to mature into a conventional bracket shape and discharge their spores. It will be interesting to revisit the site in the future to see how they have got on.